Eyelash Switch for Lightest Movement Sensing #WearableWednesday « Adafruit Industries – Makers, hackers, artists, designers and engineers! This contact switch is made from conducive thread stitched into neoprene to create “lashes” that hover over a band of silverized nylon stretch conductive fabric. Contact between a lash and the band closes the switch. In exploring different methods for detecting movement/passing of the tiniest/lightest of creates this is simple contact switch made from strands of super thin conductive thread and a surface of conductive fabric. The thread is stitched into a strip of neoprene, and stretching the neoprene allows you to adjust the spacing and height of the threads. 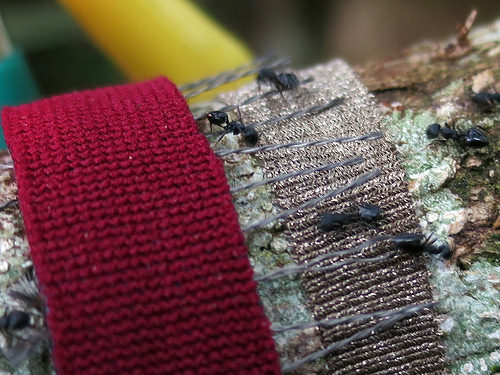 A band of stretch conductive fabric is placed just close enough to the lashes of conductive thread so that there will be no electrical contact unless an animal crawls up onto/over one of the lashes and causes it to move down against the conductive fabric. Analog sensing of this sensor might also allow to detect varying amounts of motion, or size/weight of insects….